WWE's New Era: Fact or Fiction? 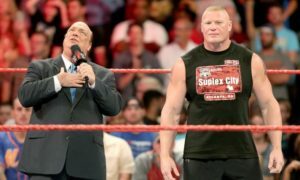 WWE’s New Era: Fact or Fiction? WWE wants fans to believe that it’s embarking upon a new era. It’s the talk of every program, every network event, and every story on WWE.com. It’s the new theme of the company, much like The Attitude Era, The Ruthless Aggression Era, and most recently, The Reality Era. In every instance, WWE laid out its vision and in every instance, fans bought in. There’s nothing wrong with this, at least not on the surface. Convincing fans to follow a certain direction is a move that the company has used for years, and that’s probably not going to change any time soon. But how much of this new theme is realistic? How much of it is actually grounded in reality, and how much is just hype to get fans to tune in? Is there any way for anyone to even know for sure? That’s the fun part, isn’t it? That’s what has everyone talking right now. Trying to understand WWE’s methods and motivations is a national pastime for wrestling fans, but the truth is we’ve all stepped through the looking glass. It’s more complex than anyone can even imagine. Or it’s not, and we’ve just all created this mystery ourselves. Maybe WWE is not that complicated. It’s a 20×20 ring, a big video screen and loud music. Men and women in colorful costumes get in that ring and perform while fans sit back and enjoy the show. The audience is passionate, they’re invested, and they expect the absolute best that the company can give them. It’s show time, it’s Hollywood, and the audience is captivated by everything that the stars do. Its traditional storytelling at its finest and the fans are only too happy to follow it as if their lives depended on it. The fan-base may be rabid, but no one can deny that without that fervor, the business likely would have died long ago. But is this supposed move to the future truly what it appears to be? How far is WWE willing to go in order to convince everyone that it means business? That question has perhaps been answered now, as WWE is officially reintroducing the brand split. Raw and SmackDown will become separate entities once again, featuring distinct rosters for each program. It was a bit of a shock for fans of course. Up until now there had really been no indication that WWE was truly considering this as an option. But now that everyone knows the deal, the puzzle pieces are indeed beginning to fit. Was this the reason for the New Era angle? After all, Raw and SmackDown will not succeed with individual rosters unless those rosters are bolstered by the NXT stars. The same is true for the newer faces that are already on the main roster. The draft and brand split has happened before; if WWE really wants to pique the interest of fans, then it should deliver these young and hungry talents. It’s the best way to get fans pumped up about it, and it’s also the best way to actually build the main rosters for each program. So assuming WWE is not flying blind here, it’s a safe bet that all of this was indeed planned out beforehand. So conspiracy theories aside, why is the New Era such a big deal? Why is it working for so many fans right now? The easy answer is usually the right answer, and the same is true here. It’s working because WWE is long overdue for a change. It’s also because fans were sick of the same old routine. Cena kicks out at two! That phrase has been uttered so many times over the past decade, that it’s become part of our vernacular. It’s also become the punch line to describe John’s wholly unrealistic immortal character, which up until Brock Lesnar, had never really had his hide handed to him. It seemed that Cena’s kryptonite had finally been found. But whether fans loved him or hated him, the fact his is act grew very tired. Cena’s appearances would usually follow the same formula, one that fans knew very well. John cuts a promo in which he acknowledges the crowd’s boos by saying he loves the town and respects their passion. He then talks about how hard he fights and how he never gives up. Then he may be interrupted by a heel, who talks trash from a distance but will not walk down the ramp to face him like a man. Cena informs the heel that if he would like some, he should come get some. John then takes off his shirt, gets in his best fighting stance, and waits. But the heel leaves instead, and when the two work their match, John wins. Wash. Rinse. Repeat. Every week the same thing happened, and fans had grown very sick of it all. Yes Cena is coming back, but in the meantime fans have been given something new and different. The brand split will ensure that more variety is added to the mix, and though John is not going to change for any reason, his routine may perhaps become insignificant now. It will just be white noise among the shake-ups that will undoubtedly take place when the draft happens. WWE needs to offer something for everyone, and now it can be argued that is exactly what’s happening. Is The New Era a tagline? Yes. Is The New Era a lead-in for the brand split? Absolutely. But WWE needs this, if only to begin moving forward. Maybe it’s not that complex after all.